Forum Index > Historical Arms Talk > Depiction of Danish warrior from 1225-1250. Posted: Sun 09 Apr, 2017 11:50 am Post subject: Depiction of Danish warrior from 1225-1250. An altarpiece - including a depiction of a warrior dated from around 1225-1250 AD - has since 1821 been at the Nationalmuseet in Copenhagen, Denmark. It belongs to a special group called "De gyldne Altre" (the golden/gilded altars). This altarpiece is a composite constructed of parts from different churches. Done before 1645 as we have evidence the whole piece existing together when brought to Tvenstrup Kirke that year (possibly elements of altarpieces from Saksild Kirke & Odder Kirke). So the image with the warrior is probably from a Church from within Odder Sogn, south of Århus, Jutland. The image portrays the child murder in Bethlehem. Is the interesting one as the sculptor likely had used a local nobleman as model, since the depiction is quite detailed. So we have a full mail, helmet with nasal guard and a fullered sword in hand with a spheroid or disc pommel (and very slightly upturned crossguard-endings?). Here's a similar sleeping guard at Christ's tomb from an altarpiece from Ølst Kirke, and an illustration of different styles of text on various Danish altars. The sword shown on the Odder altar could be be a representation of a type 2 cross, like on this sword also at the National Museum. Nice job Mark, since her paper is apparently not available online. We have the child-murder in Bethlehem with a mail-clad warrior with a raised sword. Left of the sleeping guard you showed we have a another mail-clad warrior with a sword. Also Herod is holding a sword and this has more pommel detail, than the others. Found another image from the Odder altarpiece - Herod and warrior. Both swords are sheathed. The warrior is mail-clad while Herod is seated. The altarpiece from Lisbjerg Kirke is a century older - from ~1135. Here we have an older Scandinavian Kingly Christ - "Hvidekrist" in Danish - (sadly without arms) showing no sign of having any pain. The dating on a number of these seems rather recent. I would be more comfortable with a dating of 1180-1220. Denmark was pretty conservative in some respects, so certain inventions in central Europe often shows a significant delay. It is the case with Danish latin inscriptions continuing using the Romanische Majuskel script up to ~1300 AD, whereas the change is much earlier in the Rhine area. So a delay is also to be expected with armour and weapons. The great influx of German nobility to Danish society really first kicks of "en masse" in the 1300-1400 hundreds, so from that time period Denmark follows German fashion more closely (if we observe these German-Danish nobles). We know from Saxo's writings (finished around 1210-1220) that there was a huge Danish anti-sentiment against (perceived or real) "German" behavior and fashion, both among traditional Danish nobles and the Danish Clergy, so that some would try to project a "Nordic" (conservative) look on an altarpiece seems pretty likely. From Saxo we know that some Kings tried to press for a German court culture and fashion, which were despised by the traditional Danish nobility and by Saxo himself (German behavior and fashion is effeminate to him). I can say I totally agree with your dating 1180-1220 AD if we talk about Central- and Western Europe in general, but a ~50 year added delay in conservative anti-German Denmark gives us 1230-1270 AD, which are in the range of the Golden Altar from Odder. We later see that other armour-types (Kastenbrust) seemingly are retained in Denmark (maybe even up to 1525!) and that is much longer than in Germany. Denmark was pretty conservative in some respects, so certain inventions in central Europe often shows a significant delay. It is the case with Danish latin inscriptions continuing using the Romanische Majuskel script up to ~1300 AD, whereas the change is much earlier in the Rhine area. So a delay is also to be expected with and weapons. A norwegian guy said that in Hirdskrá such armor was only permited for those with the status of knighthood, at least. So I would say that ed surcoats would be at least common in Scandinavia's Nobility by this date. And, since I'm not aware of Norway being more updated in terms of armor than Denmark, it's safe to say that Denmark was at least in equal grounds. Denmark was pretty conservative in some respects, so certain inventions in central Europe often shows a significant delay. It might be that cultural conservatism is expressed most directly in the arts? This is the impression I have from some of the later 15th century Danish frescos that seem to show "old fashioned" arms. Foreign artwork is disdained and local artists continue to write and sculpt and paint in their traditional way, while practical improvements to arms and armour are readily adopted out of military necessity. So the upshot of this might be that we may need to expect an even greater time lag between military equipment as it appears in art and in reality in Scandinavia as compared to some other parts of Europe. Yet Danish (and Scandinavian) conservatism is present in many spheres in this period. It does seem their choices were based on a totally different strategic and tactical view on how to conduct warfare and what type of equipment were needed to conduct it? Scandinavia also kept a markedly strong "resistance" religiously to German influences even down to parish level as the early 1200's as the Golden altars show. 1) Use of charge cavalry is first observed at the battle of Fotevik in 1134 AD. Until this instance cavalry was used as mobile infantry as it has been in the Viking Age. Denmark became Christian in 986 AD and had fought with Frankish armies for centuries before the conversion. So why did it take 150 years even after becoming Christian, before charge-cavalry was used? Some conservatism in how to conduct warfare seems reasonable. In the early 1200's Denmark had fully embraced Charge-Cavalry ("Knights") and actually danish warhorses was famed all over Europe. 2) Another interesting tactical aspect is that Scandinavian armies in civil war actively sought - through maneuvering on both land and sea - to engage each other in pitched battles and avoid prolonged sieges, even when they had good castles. Arstad, Knut (2013): The use of castles as military strongholds in the Norwegian civil wars of the 12th and 13th centuries. "As the existence of the Norwegian castles demonstrates, there was no absence of knowledge in this country of techniques for effectively fortifying strongholds during the 12th and 13th centuries. The limited number of such constructions was therefore not the result of the Norwegian commanders' ignorance of military science or effective methods of fortifications. Instead, this was the outcome of a deliberate choice based on what was regarded as appropriate within a Norwegian context. This lead to a formulation of a strategy of manoeuvre based on a field arm capable of giving battle, both on land and sea, Consequently, the commanders attached only minor importance to castles and strongholds". Only with Håkon V (1299-1319) is the method of building counter-castles (Bohus Castle) introduced in Norway. Meaning the first instance where a Norwegian King cared about "borders" and places, instead of strength of field armies. So the European way of fighting was well known, just not something copied for a long time. For me it seems that pre-1300's a Norwegian pretender or King would lose all support if he "cowardly" took a defensive stance. Only a "manly" aggressive and offensive approach of seeking out the enemies forces, no matter where in Norway they were located, was central. Control of places meant nothing, defeat of the opposing pretender on the battlefield everything. For Denmark it seems as well that a European style of fighting (strong focus of strongholds and place-control) also first really emerged in the 1300's. First with Valdemar IV Atterdag (1340-1375) it is most certainly there as the absolutely central strategy in his struggles against the Hanseatic League. [He certainly still continued bold offensive campaigns as the attack on Visby 1361, but it was no longer the prime strategic focus to seek out the deciding pitched battle]. I have a gut feeling that the change might have started in Denmark after Valdemar II Sejr's defeat at Børnhoved in Holsten 1227 and the dissolution of the Danish Baltic Sea Empire. A more defensive stance as the result of the heavy defeat could have caused a gradual change in Danish rulers towards a more defensive posture. 3) Religious stance of Christology - the concern for Danish clergy even at parish level, that German iconography was against the dignity of Christ. Again certainly obvious for Saxo and his view of the effeminate ways of Germans. Nyborg, Ebbe (2014): Bysantinisk prægede krucifikser i højmiddelalderens Danmark – hvordan, hvornår, hvorfor? "One main reason for the obvious conservatism would have been a (lay and clerical) concern for the dignity of Christ." The Christus Patiens first gets really dominant in Denmark after 1250 AD. So Denmark kept a Byzantine Christology as the "Distant Lord and King", whereas the "Suffering Gothic Christ" emphasized him as man. So a change to an emotionalizing and emphasize on love between God and man on a individual basis. This change happened in Germany in the 1100's. In Denmark we again see a 150 year delay - (interestingly the use of charge-cavalry also showed a 150 year delay) - and that must show a very deliberate stance against a neighbor's views. Probably this "un-manly" suffering Christ with a focus on emotions is another typical example of the effeminate ways of the Germans, that makes for an undignified Christ. No, a Scandinavian Christ is a "real man", a Cosmic King never showing weakness on the cross (Christus Triumphans). "tårer, gråd og sorg blev i den grad afskyet hos danskerne, at ingen måtte græde over deres synder eller kære afdøde". -> Tears, weeping and grief was to a high degree despised by the Danes and no one was to cry over their sins and their beloved deceased. A suffering Christ and an emotional attachment to him was an offense to conservative Scandinavians. The change to accept this Christology took a long time. I have to say that still up until modern times weeping is seen as something absolutely un-manly. With globalization it might be changing somewhat. At funerals you absolutely do not engage in emotional displays as a man, as it shows offense to the person deceased. If you really loved the person, you would control yourself, even when it is most unbearable. A display of emotion shows the world, you didn't really care that much, as you didn't use all your effort to send the beloved on with dignity. We have the expression "Tudefjæs" (Cry-face) for men and women showing tears. It's a bit more accepted for women, but still regarded as weak and undignified. 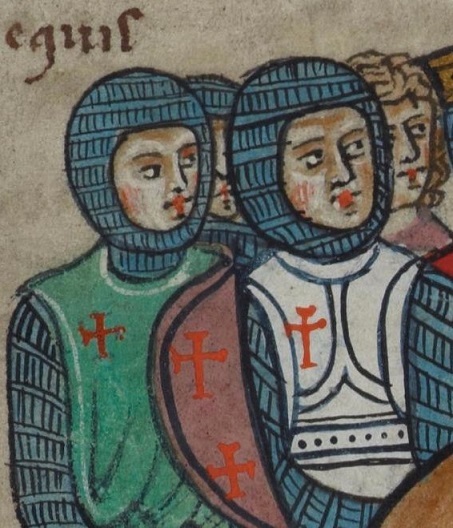 With the regard to the Børnhoved battle we have a german image from the Sächsische Weltchronik (1229-1277) of the German- (left) and Danish knights (right) . It is unknown whether the image is based from a witness to the actual battle, but it does highlight one important point. The artist clearly displays that some Germans have helmets with horns and crests and the Danes do not. Both have surcoats, though. Also since the Weltchronik was made over a long timespan, we don't know if the image is a few years after the battle or 40 years later? So it is absolutely possible that Danish Knights did have surcoats in the early 1200's, but that the warrior portrayed on the Odder Kirke altarpiece just didn't wear it. That is actually an intriguing possibility, Mark. A Danish noble being used as a model for an altarpiece in local parish might actually arrive in old-school armour! So the helmet with nasal guard and good old mail without any "german fanciness" on the Odder Altarpiece! So if one freely speculates a noblemen could have "home-armour" and "campaign-armour"?! We did see that enormous long use of Kastenbrust on danish church murals, so it might be a conservatist signaling on the local parish level. It was after all the Kings and imported german nobility (especially from ~1400) that were most pro-german and the old school danish Herremænd and the general populace, who likely were most against.